Rusty is wearing the TSG-1201 shirt made with TenCate Oasis®. Secondary layer shirts and pants are constructed from fabric that will not burn, melt, or drip. The shirts and pants are light weight, comfortable, and inherently flame resistant. Using proper laundry techniques, these garments can be a cost-saving opportunity. Our fabrics include Oasis® and a new fabric called Alloytec. Both have been tested by The Aluminum Association. Please contact Tri-Star Glove if you would like more information regarding fabric testing. 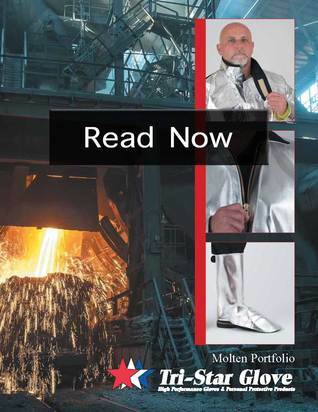 Please click on the online Tri-Star Glove molten portfolio. Once open, use the arrows on the side of the screen to flip pages. Use the icon in the bottom right corner to download. Looking For A Custom Garment? At Tri-Star Glove, our specialty is custom designed garments and gloves. The primary and secondary PPE shown on our site is only a small sample of our capabilities. Contact us to see how we can create, trial, and develop a molten metal splash protection program for you.